Step off your ship in Skagway port and board a vintage Gold Rush–era train on this full-day shore excursion to the Yukon territory. Travel along the White Pass and Yukon Route Railway through Alaskan and Canadian wilderness. Arrive in the Canadian town of Carcross and explore the Bennett Station House museum for more insight into Gold Rush history. Enjoy lunch on board the train and see the popular attraction of Emerald Lake. 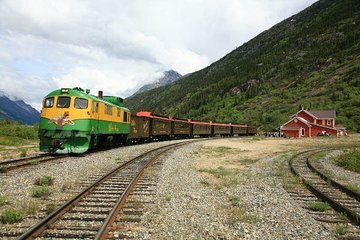 This Skagway train excursion includes port transport. Visit beautiful Emerald Lake, arguably the most-photographed lake in Yukon! Following the scenic trail of Yukon's Gold Rush explorers, this train journey earns rave reviews. After port pickup in Skagway, a mini-coach whisks you along the Klondike Highway to the train station. Step aboard a replica vintage Gold Rush–era passenger train. During your 68-mile (109-km) journey to Carcross in the Yukon, you’ll journey along the same route of remote wilderness taken by the Klondike stampeders — including the White Pass and Yukon Route Railway, built in 1898 during the Gold Rush. Learn more about these intrepid travels from your guide along the way. Make a stop at the restored 1900s Bennett Station House, located in an area accessible only by train. Take some time to independently explore the site that’s been converted into a museum. Back on the train, enjoy lunch (see a sample menu below) en route to Carcross in the Yukon territory. Upon arrival in the Canadian town, visit the Matthew Watson General Store — the oldest operating store in the area — or stroll through historic Carcross. Then, stop at Emerald Lake to take pictures of the gorgeous lake, one of the most photographed in the Yukon, before your train heads back to Skagway. Your full-day shore excursion ends with transport back to port. Please note: You must bring a valid passport. We will ensure your timely return to the Skagway port for this activity. In the rare event your ship has departed, we will arrange for transportation to the next port-of-call. If your ship is delayed and you are unable to attend this activity, your money will be refunded. See our terms and conditions for full details. Wonderful excursion. Amazing scenery, staff was wonderful. Lunch was just ok. They were very accommodating for my mother who uses a walker. Everyone very helpful. Of all the ports we stopped in this was by far the best excursion. You need to take this tour. The weather was outstanding to take pictures and just admire the beautiful landscape. Make sure you bring a quality camera because you will never put the camera down. This is a MUST DO if visiting Skagway. We took the bus up and had the most amazing guide James. He was very friendly and knowledgeable. The bus made several stops to get out and take pics and see wildlife. The train was also great. The views can’t be beat. TIP: Ask which side to sit on to get the best view. The guides on the train were just okay. Did not provide the kind of knowledge and service James did, but all in all great experience. I recommend doing the bus and train verse just the train. You will get a more in depth view of the area when on the bus as they stop and can get to areas the train could not. This was a great combo doing the bus up to Carcross, and train on the way back to Skagway. I highly recommend this tour. Our tour started with a bus ride to Carcross. I was happy to have a wonderful guide that stopped at many places for us to get out and take pictures of beautiful visas we even saw a bear and its cubs from safely within the bus. We had a little time in Carcross before boarding the train back. I would have loved to have had a bit more time in the quite town of Carcross, but it didn't ruin the experience. There are viewing areas outside between each train. I would suggest the back car as we enjoyed standing outside on the back of the train and thought the view from that spot were spectacular. Beautiful sights and very knowledgeable guides aboard the train. We stopped for a good amount of time in Lake Bennett. Plenty of time to visit the museum, view the film and walk the charming town. 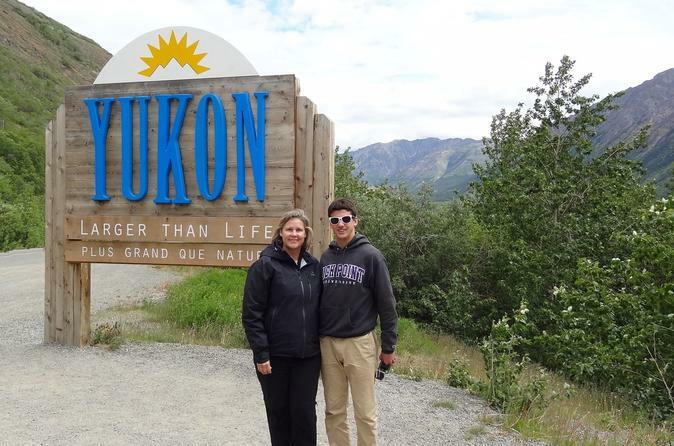 Overall one of the best experiences of our trip to Alaska. This was one of our top 3 days of 2 weeks in AK. We would take this train ride again. We did the van tour with a fantastic guide who provided us with stimulating stories and stopped for us to take pics every time we saw a bear or other wild life. Then after buying delicious ice cream in the private family owned town shop, we took the train back towards Skagway arriving directly in the town. Every moment of the train ride was breathtakingly beautiful. I took hundreds of photos while standing between the train cars and great video too. The staff were knowledgeable and courteous. The train is comfortable. The lunch is sufficient. You won't be hungry. We bought a book, cap, and professionally made video of our trip because we enjoyed it that much. We would highly recommend this tour to everyone, young and old, and until the Kenai Fjords National Park Cruise boat tour, this was our favorite day. This is truly not to be missed! loved it! Great views and lunch! Wow, the scenery was awesome. It's a really relaxing way to see some very remote areas. This was an amazing excursion! The views where amazing and we actually saw a rainbow between the mountains while we where on the train. Mike was our driver, he was very informative and had a great personality. Would recommend this tour and try to get Mike as your bus driver!